Catellani and Smith has created several organic light fittings for its outdoor collection that blend with a natural environment while adding a sculptural quality, in this case as a cluster. Syphasera features thin brass stems with luminous tops, made of opaline glass. 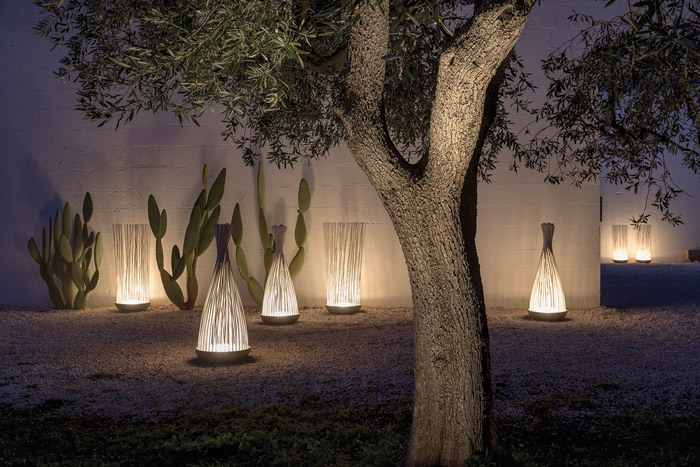 Available in several sizes (from 65cm through to 140cm high), they form a family of customisable light sources, which are available in different versions for the ground, for pots or for water. They have a 5W LED G4 source (2700K, 150lm, CRI 85). 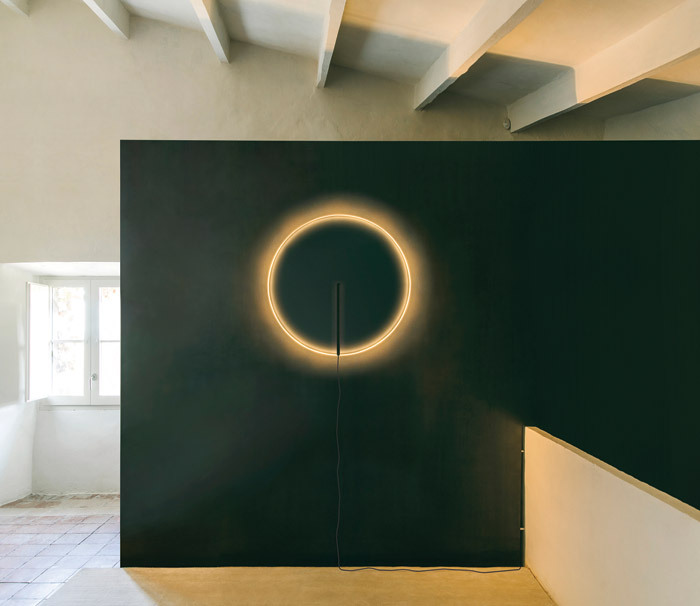 Designed by Amsterdam-based Formafantasma, the WireRing wall light comprises two elements: a custom-made belt-like 250cm electric cable made of coloured rubber and an aluminium ring housing an LED strip. The cable is fixed to the wall with ABS joints in the same finish as the ring. An indirect light, it has a foot dimmer switch that allows 10-100 per cent light adjustment. The source is 16W (2700K, 1300lm, CRI 90). The ring comes in golden glossy, nickel glossy black, white, grey or pink, while the cable can be white, grey or pink. 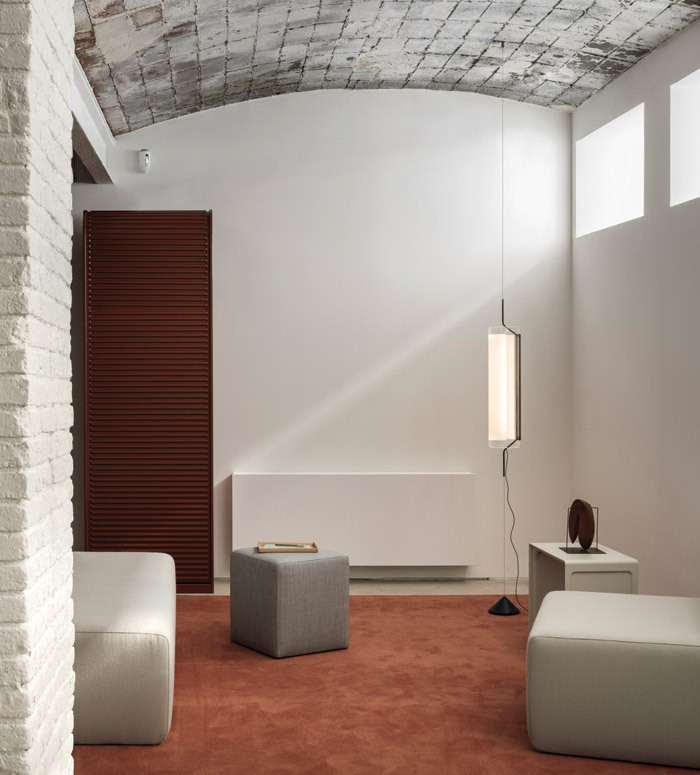 The new glass-based collection for Spanish company Vibia was designed by Munich-based Stefan Diez. Trained as a cabinetmaker before studying industrial design at the State Academy of Fine Arts in Stuttgart, Diez is known for using simple materials to create his award-winning furniture, tableware and lighting. He began by exploring the relationship between light and transparency, testing different materials – paper, PVC, acrylic – for their ability to reflect LED light before turning to the traditional luminaire medium, glass. ‘Light conducted by glass is invisible, only emanating at the edges,’ says Diez. First was the Guise wall lamp, featuring a slim row of LEDs recessed into the flat disk. The light is conducted to the edges of the glass circle where it radiates with an intense glow. Following the wall lamp, different designs were developed, in which the light source itself always remains invisible. The glass cylinders are suspended vertically and horizontally, with the light emanating from patterns etched on to the glass, so they seem to float in space. The technique is borrowed, says Diez, from that used for backlighting LCD screens or Perspex emergency signs. The name comes from a white Asian flower, Diphylleia grayi, also known as the skeleton flower, whose petals turn transparent on contact with water. The appearance of the flower is evoked by the fitting’s flowing organic shape and transparent PMMA diffuser, distinctively patterned with laser micro-incisions (the company’s OptiLight technology) for a bright, even light. Once the lamp is turned off, it is completely transparent, but when turned on, the subtle pattern becomes visible. 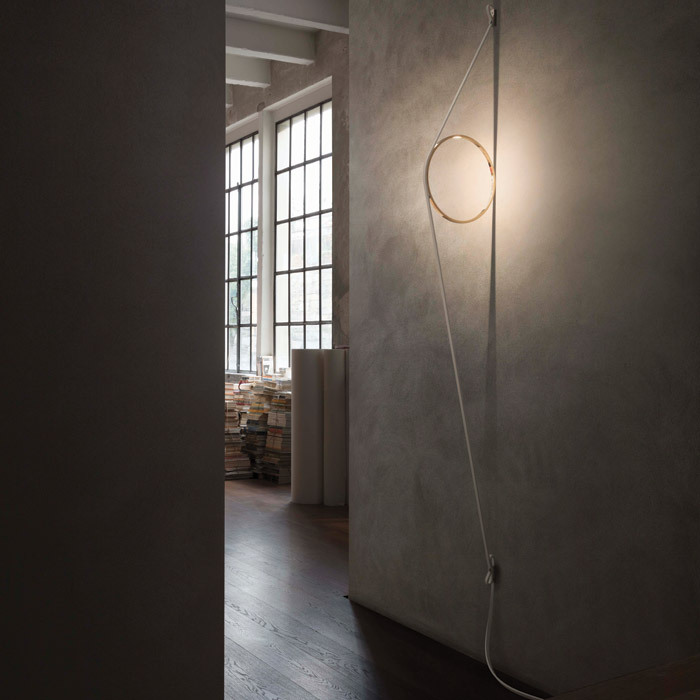 The design is minimal with the LED source housed in a slim, white-painted aluminium central rod, while two thin steel cables act as both support and conductors, connecting to a white oval ceiling rosette. The luminaire, dimmable using Dali, comes in pendant (including triple option), ceiling-mounted and floor-standing versions. 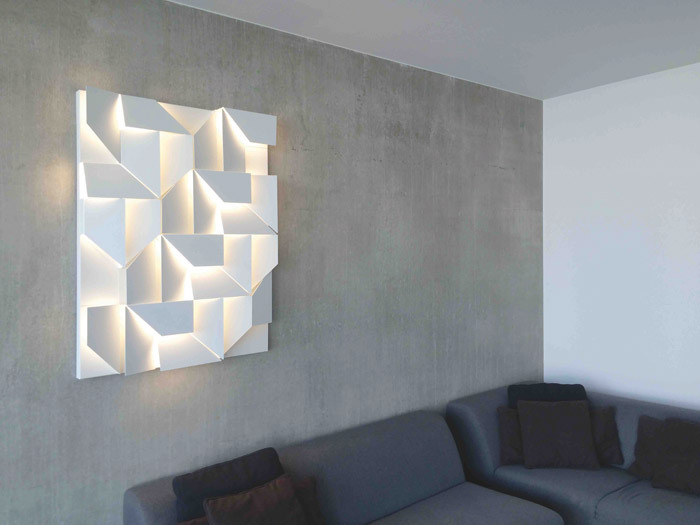 Designed by Paris-based Lebanese designer Charles Kalpakian, Wall Shadows completely blurs the boundaries between lighting and art, playing with light, shadow and perception. Created in 2013, the version shown is Wall Shadows Grand, the largest (120cm x 30cm x 12cm), but smaller, simplified versions are available (45cm x 30cm x 12cm; 45cm x 15cm x 12cm). 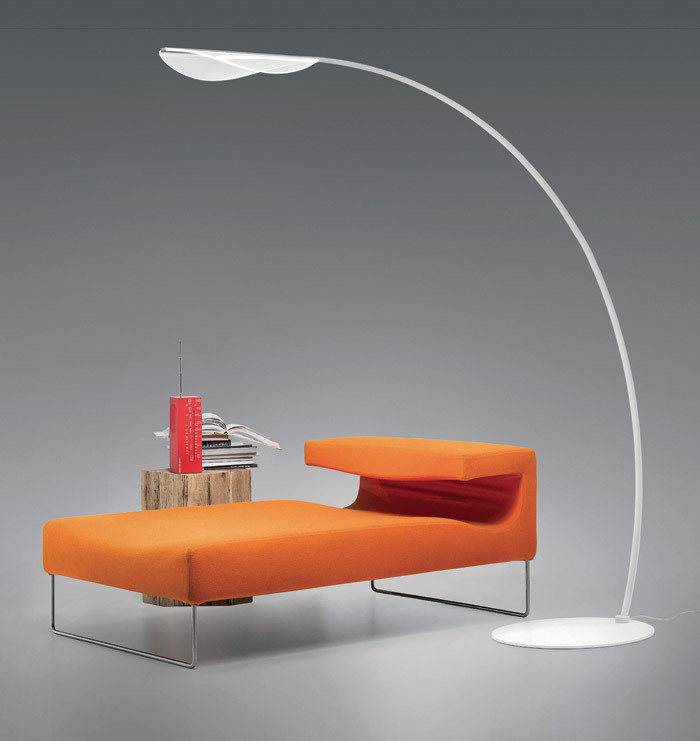 It is dimmable and made in matt-white, powder-coated aluminium. The source is 55W LEDs (3000K, 5300lm). There are a few variations on this theme in lighting, evocations of grass or reeds, some individually lit or, as here, uplit from the base. Designed by Matteo Ugolini, Don’t Touch has a matt-grey bowl and matt-white stems. Measuring 108cm high and 42cm across, it can be used indoors or out (IP67). The LED source is 29W (2600lm, 2700K/3000K, CRI 80).